We are excited to present a series of guest bloggers to the Soakworthy space. They will be posting on all sorts of topics, from Lingerie design and production, to knitting and sewing as art. We look forward to expanding our idea of what is soakworthy. As usual, the opinions expressed are those of their author, and do not necessarily reflect the opinions of Soak Wash Inc. Enjoy! Hello! I am Natalie Selles, a maker and blogger, shop girl and social media consultant in Toronto. I work here at Soak writing the blog and helping out with all things internet and marketing. I’m excited to be able to post a bit of my own perspective on knitting and washing, especially washing socks. I’ve been knitting socks for about 6 years now. I’m not sure exactly how many pairs I have knit over the years, but I probably have about 20 in regular rotation just for myself. One of the most common questions I get about wearing handknit socks (or handknits of any kind) is about how I care for them. A lot of people only want machine washable sock yarn, or can’t imagine knitting socks with something that doesn’t have nylon in it. Now, I know that the Regia and Kroy yarns are some of the most durable yarns out there, but I knit my socks out of everything. I’ve got worsted weight boot socks out of Cascade 220, handdyed merino/cashmere/nylon blends, Koigu KPPPM and all sorts of other delicious buttery soft yarns. I knit them and I wear them and I handwash them all. When I first started I put a few things through the wash that said machine wash or super wash on the label. My socks came out just fine, and that worked pretty well for me. However, in the last few years, once my sock stash started to rival my sock yarn stash, I started to handwash them all. I now hand wash everything I knit, whether it needs to be or not. My favourite way to do it is to fill up the biggest bin I own and do it all in one go. This bin is my bathtub. I fill it about half full with lukewarm water, then add a generous amount of Soak, and dump everything in. I forget about it for an hour or so, just to make sure that everything has really absorbed the water. Then I go back, squeeze everything out and hang it up. Sweaters and larger items get laid flat, but they get washed less often, so I don’t worry about them as much. Every two weeks or so I do a big load of socks and that keeps me going for the next while. 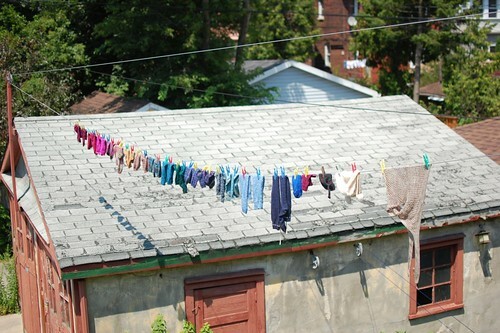 I am very much looking forward to the weather warming up so that I can start hanging my socks up on the line, as I did in this photo from a few summers ago. Right now it is taking an awefully long time to dry anything in my apartment!